After sitting through an uncomfortable (albeit excellent) show this morning, I relished the comfort of an aeroplane seat in a storage container outside Summerhall. A somewhat odd place to be sat in total darkness, but a cushy change nonetheless. I went into Darkfield’s Flight literally and metaphorically blind. Entering the container, I was greeted with an exact replica of an aeroplane cabin, complete with safety manuals and overhead cabins for bags. Despite this attention to details, as soon as the show begins, the audience is plunged into complete darkness. The experience comes through the binaural soundscape. The soundscape in question brims with dry humour and whispered secrets that act as the stitches to this beautifully constructed audio journey. The performance imitates meditation as the audience lose all sense of being. I couldn’t discern whether what was happening around me was real or my imagination filling in the blanks. Darkfield had a clear rationale in creating this piece, weaving a cleverly enigmatic atmosphere throughout. I’d rather not divulge what Flight entails; not knowing is half the fun. 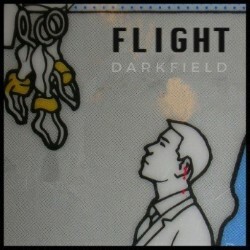 Nevertheless, I applaud Darkfield’s vision, that is expertly executed within the brief twenty-five-minute experience. I left this show invigorated with life. Flight is an exciting example of what immersive theatre and audio manipulation can achieve. Get your boarding passes now.